ALL applicants must live within 30 minutes of Back Bay and must have reliable transportation or access to public transportation. ALL applicants must be able to work flexible hours. SkinHealth is Boston’s leader in facial rejuvenation treatments, laser, cosmetic surgery, body sculpting and advanced skin care. Since 1999 we’ve been helping men and women of all ages look naturally younger. “Look fresh and vibrant at any age”, that is our mission.Our winning formula is the unsurpassed expertise of our staff which includes three Harvard-trained, board-certified cosmetic surgeons, nurse practitioners and medical aestheticians as well as specialized technicians for nail services. 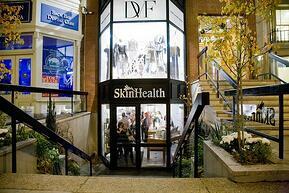 SkinHealth Centers are located in Boston on Newbury Street, and in Wellesley Hills. Overall responsibility for the front desk and customer service department, which includes client interactions and customer relations, appointment scheduling, processing sales tickets, opening and closing spas, handling phone calls, retail product sales and inventory management, maintaining client records and date base, and management of the physical facilities. Must represent SkinHealth to patients, clients, physicians and practice employees in a positive light and a professional manner. Based in Wellesley Hills, MA, this is a hands-on position that encompasses performing the duties outlines below. It is expected that all clients and patients will be greeted in a friendly manner and treated with utmost respect and courtesy. A positive, upbeat, service-oriented attitude is imperative. Should maintain a cooperative and team oriented approach to the job. Specific Responsibilities of Customer Service Representative are outlined below, after qualifications. Collection of payments: credit card processing, bank deposits, CareCredit, co-pays, deposits, etc.